Accountant in Bankruptcy seized disability benefits to pay law firm’s disputed fees MEDIA REPORTING of a case in which a sequestrated client’s Disability Benefits payments were illegally seized for nearly FOUR MONTHS by the Accountant in Bankruptcy (AIB) over a wrangle involving debts which a Perth based law firm, Kippen Campbell claim are owed to them over a collapsed court case, appears to have helped the client, Mr William Gordon (also of Perth) finally gain access to money desperately needed for living expenses. Mr Gordon apparently discovered his accounts had been unfrozen last weekend, but no one from the AIB has contacted him over the matter or offered explanations as to why they had seized his benefits payments. Diary of Injustice reported last week that Mr Gordon was apparently sequestrated by his former law firm after a series of bitter, ‘one sided’ court actions held in Perth Sheriff Court, where agents acting for Kippen Campbell demanded Mr Gordon be sequestrated to pay fees they claimed were due to them for legal services provided for a medical damages claim being heard in the Court of Session. 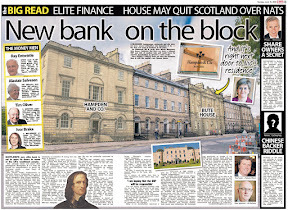 Earlier last week, the Herald newspaper & Scottish Law Reporter reported that attempts had been made to seize Mr Gordon’s home by Glasgow based accountants Wylie & Bisset who are acting on behalf of the Accountant in Bankruptcy. Wylie & Bisset were apparently convinced Mr Gordon owned his property. Apparently not content with seizing Mr Gordon’s home, the agents acting for the AIB attempted to seize another property owned by an unconnected family who live in Rattray, Blairgowrie, whose surname is also Gordon. 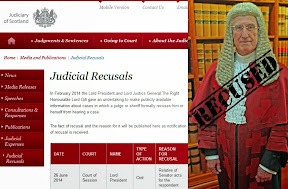 The official went onto tell Diary of Injustice that her organisation had received numerous reports of law firms threatening clients with bankruptcy if they did not pay what appear to be dubious demands for fees. In other cases, law firms have simply gone ahead and made their clients bankrupt without even giving them a chance to question the legitimacy of the fees claimed to be owed. The Accountant in Bankruptcy was asked to explain why Mr Gordon’s bank accounts & benefits payments had now been unfrozen after the media coverage. The AIB refused to issue any comment. It has also been revealed the Financial Ombudsman is investigating why Mr Gordon’s bank accounts were seized and why benefits payments were also frozen by the AIB. 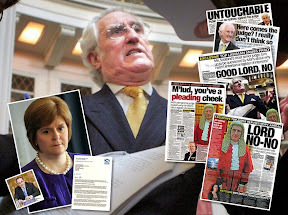 While the Financial Ombudsman has declined to comment on the case, documents provided to them appear to raise serious questions over the validity of court documents coming out of Perth Sheriff Court which were used to ‘sequestrate’ Mr Gordon and put him through months of torture. Since last week’s report, a number of individuals have contacted Diary of Injustice with regard to problems with the Accountant in Bankruptcy, and their agents apparently seizing benefits payments on multiple occasions. Coincidentally or not, some of these cases also relate to dubious fee demands by law firms who have left their clients with ruined legal cases. 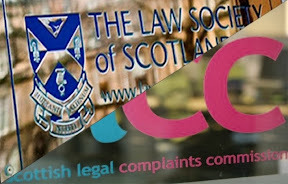 Indeed, the trend of law firms using threats of bankruptcy against clients appears not to have gone unnoticed by the Scottish Government, reported in last week’s article where a senior source in the Government acknowledged there was a growing problem with law firms threatening clients over legal fees. He went on to say he believed law firms were using their influence in local courts to easily obtain bankruptcy orders against clients who have little or no chance of obtaining legal representation to challenge the law firms demands. 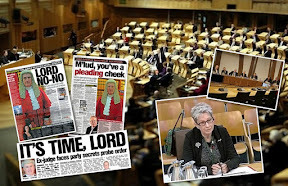 Blame Game : Did Scottish Government blunder over wording of ‘talking’ lay assistants laws, or did courts become too protective of lawyers vested interests? 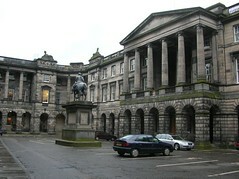 ACCUSATIONS of court interference & counter claims of blunders by the Scottish Government over the wording of legislation passed by Holyrood in 2010 which conferred the right of lay assistants (otherwise known as McKenzie Friends) to address the court on behalf of party litigants have prompted a series of exchanges between msps, various court rule making bodies & the Lord President over claims the reforms intended to allow lay assistants to address courts are unworkable in their current state. 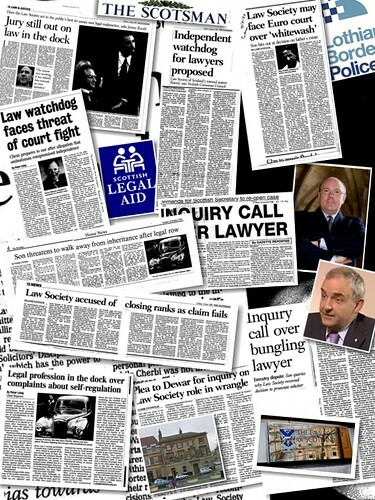 The widely praised ‘talking’ McKenzie Friend reform, was put forward in 2010 by the then Communities Safety Minister Fergus Ewing & reported by Diary of Injustice Scotland to get ‘talking’ McKenzie Friends as consumer pressure on court access & rights of audience prompts new proposals for Legal Services Bill, with the Legal Services (Scotland) Act 2010 as it was later passed at Holyrood, giving the Court of Session powers in Sections 126 & 127 of the Act to make rules permitting a lay person to make oral submissions to the court on behalf of a party litigant. 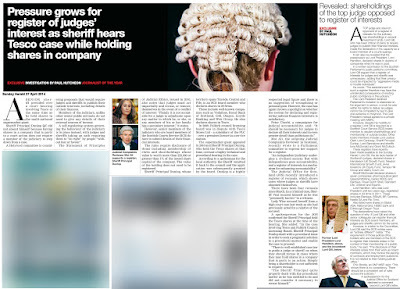 A short consultation was then launched for views on how lay assistants with the ability to address the court, reported by Diary of Injustice HERE and the provisions for ‘talking’ lay representatives came into force on 1 September 2011. The actual rules giving lay representatives the right to speak in the Court of Session only came into force earlier this month, after lengthy discussions between the various court bodies over ensuring McKenzie Friends could not charge for their services, a move which seems to have more to do with blocking any competition between McKenzie Friends & lawyers for business and thus sheltering lawyer’s profits, than ‘protecting’ the rights of party litigant. 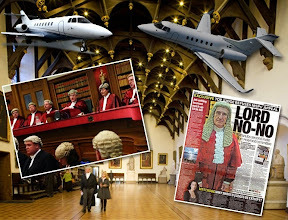 However, somewhere in the mess of discussions between the courts which focussed too heavily on protecting their colleagues in the legal profession from losing out materially & financially to McKenzie Friends, it now transpires the courts have added some conditions of their own, over and above those contained in primary legislation. effectively blocking the rights of lay assistants to address the court. 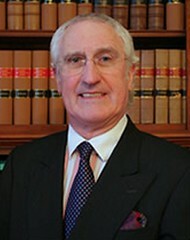 The Committee wrote to the then Lord President, Lord Hamilton, asking for further details which generated a response that “the requirement on a prospective lay representative to declare previous convictions was intended to require the disclosure of all convictions, including those which are spent for the purposes of the Rehabilitation of Offenders Act 1974.”, a condition which appears the courts have inserted themselves far & above what was allowed or envisaged via the Legal Services Act (Scotland) 2010. 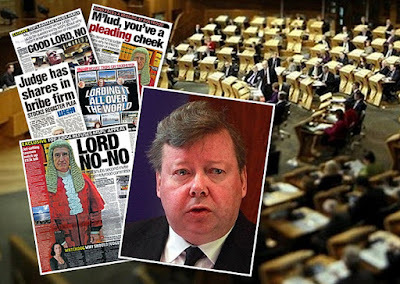 The Committee, not being satisfied with responses received from the Lord President, has remitted the matter back to the Scottish Parliament’s Justice Committee for further consideration, after it’s Convener, Nigel Don made it plain he felt the courts had overstepped the mark in enforcing stricter than necessary requirements for McKenzie Friends to address Scottish courts. 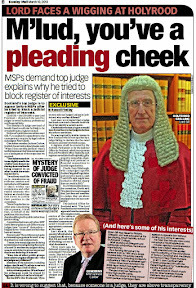 However a new problem for lay assistants being able to address the court has arisen, after a lay member of the Sheriff Court Rules Council apparently spoke out to the media, accusing the Scottish Government of making a mess of the wording of the Act, not the first time such accusations have been made about poorly thought out & weak or vague worded legislation concerning so-called ‘reforms’ in the justice system. Asked for a comment on accusations made against the Scottish Government, a spokesperson for the Sheriff Court Rules Council declined to comment and the Scottish Government have not responded to queries over the matter. 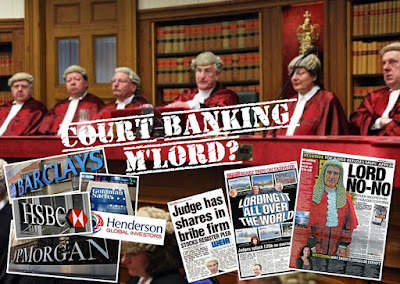 Legal insiders have since speculated the wording of the Legal Services Act (Scotland) 2010 may have been purposely framed so vaguely as to allow members of the judiciary to refuse to allow lay representatives to be able to address the court on behalf of party litigants. 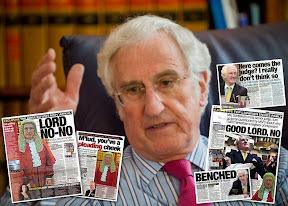 He went onto say : "With the worries of some in the legal profession that litigants may turn to using lay assistants rather than expensive legal teams who may end up generating large legal bills with little to show for it, one could perhaps speculate the badly worded sections are no accident, and were indeed designed to impede lay assistants, or McKenzie Friends from addressing the court"
Speaking to Diary of Injustice this afternoon, a solicitor based in England said he was appalled over the wrangle in Scotland over lay assistants. 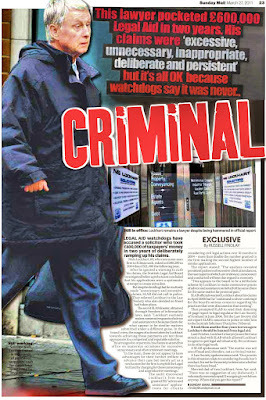 He said : "Only Scotland could manage to screw up McKenzie Friends with rights of audience features no one really wants. Was it done on purpose to discredit their use as time went on ? I think this could be a possibility." 45. This instrument amends the Rules of the Court of Session by inserting a new Chapter 12B which makes provision for lay representation before the court. It also revokes the Parts of Chapter 41 which relate to applications for permission to appeal against decisions of the Upper Tribunal. 46. 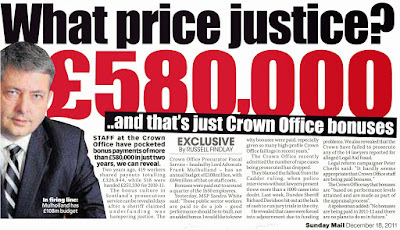 The instrument is not subject to any parliamentary procedure and comes into force on 9 July 2012. 47. As part of its scrutiny of the instrument the Committee asked for clarification of various points from the Lord President’s Private Office (“the LPPO”). The correspondence is reproduced in Appendix 5. 48. The Court of Session (“the Court”) has power to make rules regulating the procedure and practice to be followed in that Court, in terms of section 5 of the Court of Session Act 1988 (“the 1988 Act”). These Rules are made under that power and they modify the Act of Sederunt (Rules of the Court of Session 1994) 1994 (“the Rules of the Court of Session”). 49. This instrument makes two separate amendments to the Rules of the Court of Session: paragraph 2 inserts the new Chapter 12B on lay representation, and paragraph 3 revokes certain of the Parts of Chapter 41 which the Court declared to be ultra vires in the case of KP and MRK v Secretary of State for the Home Department. This report is concerned with new Chapter 12B only. 50. 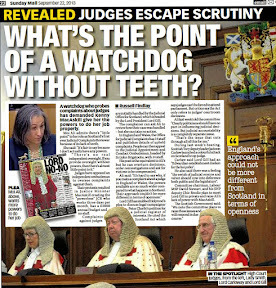 Section 126 of the Legal Services (Scotland) Act 2010 amended section 5 of the 1988 Act to insert section 5(ef) which confers power on the Court to make rules “to permit a lay representative, when appearing at a hearing in any category of cause along with a party to the cause, to make oral submissions to the Court on the party’s behalf”. 51. Chapter 12B prescribes that the party who wishes to have a lay representative make oral submissions must enrol a motion accompanied by Form 12B.2. This form must be completed by the party and by the prospective lay representative. It requires the prospective lay representative to make five different declarations relating to financial interests, confidentiality, convictions and whether or not the prospective lay representative has been declared a vexatious litigant. It is then within the discretion of the Court to decide whether the lay representative may appear. It may permit that appearance only if it is of the opinion that it would assist the Court. It appears that the Court, in exercising that discretion, will take into account the declarations made on Form 12B.2. 52. In its response of 21 June 2012, the LPPO confirmed that the requirement on a prospective lay representative to declare previous convictions on Form 12B.2 was intended to require the disclosure of all convictions, including those which are spent for the purposes of the Rehabilitation of Offenders Act 1974 (“the 1974 Act”). 53. The Committee observes that section 4 of the 1974 Act relieves persons whose convictions are spent from the ongoing consequences of having to declare a conviction. It notes in particular that section 4(1)(b) of the 1974 Act provides that such a person must not, in any proceedings before a judicial authority, be asked or required to answer any question relating to his or her past “which cannot be answered without acknowledging or referring to a spent conviction or spent convictions”. It further notes that section 4 of the 1974 Act is subject to the limitations on rehabilitation set out in section 7 of that Act, and to the exclusions set out in the Rehabilitation of Offenders Act 1974 (Exclusions and Exceptions) (Scotland) Order 2003, which is made by the Scottish Ministers in exercise of the powers conferred by section 7(4) of the 1974 Act. 54. It accordingly appears to the Committee that Form 12B.2, in so far as it requires persons to declare convictions which are otherwise spent, purports to disapply section 4(1) of the 1974 Act. The LPPO was asked to explain the basis on which such provision might lawfully be made. The LPPO takes the view that the rule-making powers of the Court in section 5(a), (b) and (ef) of the 1988 Act, when read in conjunction with section 7(3) of the 1974 Act, confer power upon the Court to make provision of this nature. 55. The Committee observes that the Parliament expressly conferred the power to make rules permitting lay representation before the Court when it enacted section 126 of the Legal Services (Scotland) Act 2010, inserting section 5(ef) of the 1988 Act. The Court, in its judicial capacity, has held that section 5(a) of the 1988 Act cannot be relied on to supplement any of the specific powers otherwise conferred in that section. 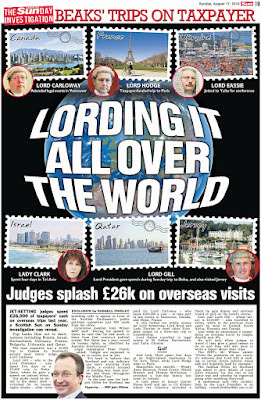 As the Lord President (Hope) commented in Taylor v Marshalls Food Group, “[h]ad Parliament taken the view that para. (a) was as general as counsel suggested, then it would not have found it necessary to insert the new paragraph […] to allow the court to make acts of sederunt in relation to expenses.” In light of this judgment of the Court the Committee takes the view that neither paragraph (a) nor (b) of section 5 enables the Court to make provision which, properly construed, is ancillary to the power to make rules permitting lay representation conferred by paragraph (ef). 56. Furthermore, in the Committee’s view there is nothing in paragraph (ef) which permits the Court to make rules which override primary legislation, in particular the prohibition on requirements to disclose spent convictions established by section 4(1) of the 1974 Act. It appears to the Committee that the Court is seeking, in its legislative capacity, to specifically override provision enacted by the UK Parliament in a manner which is not subject to the Parliament’s supervision. It observes that such a power exists but that it is a power exercisable, post-devolution, by the Scottish Ministers and only with the express approval of the Parliament. 57. So far as the LPPO seeks to rely on section 7(3) of the 1974 Act, the Committee accepts that this is a power exercisable by a “judicial authority” (a term which includes the Court) to require the disclosure of spent convictions. However, it notes that this power is subject to significant restrictions. First, and fundamentally, there is nothing in section 7(3) to suggest that it may be exercised by the Court in its legislative capacity. In the Committee’s view, it is quite clear from the reference to that power being exercisable “at any stage in any proceedings” that it is exercisable by the Court in its judicial capacity when dealing with individual cases. It is unpersuaded by the suggestion that the exercise of the Court’s legislative functions could be taken to constitute a stage in proceedings: the very nature of the rule-making function is that the resulting rules apply in all cases, and there would be no exercise of the section 7(3) power in each individual case. The Committee also notes that this power is exercisable only where the authority, in relation to the proceedings, considers that justice cannot be done without admitting evidence of spent convictions. 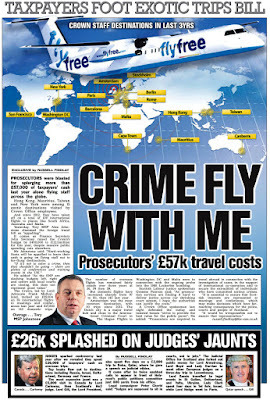 The LPPO has not identified why it would invariably be the case that justice could not be done, where a lay representative is involved, unless that lay representative discloses spent convictions. 58. The Committee accordingly considers that the LPPO has not been able satisfactorily to explain how the Court may, by Act of Sederunt, disapply the provisions of section 4 of the 1974 Act. It does not consider that section 5 of the 1988 Act confers any such power. Furthermore, it is unpersuaded that section 7(3) of the 1974 Act is capable of being exercised in a blanket fashion by the Court in its legislative capacity. 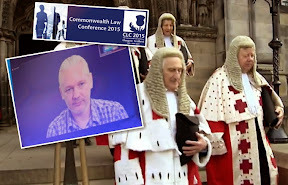 It appears to the Committee that section 7(3) is intended for use by any court when exercising its judicial functions on a case-by-case basis in individual court proceedings. 59. For these reasons, the Committee considers that it is doubtful whether this instrument is intra vires in so far as it inserts Form 12B.2 into the Rules of the Court of Session when that form is intended to require prospective lay representatives to disclose spent convictions. That provision appears to be of doubtful vires because it purports to disapply the effect of section 4(1) of the 1974 Act in the absence of any power enabling the Court of Session to make rules to that effect. 60. The Committee therefore draws the instrument to the attention of the Parliament on reporting ground (e) as there appears to be a doubt about the vires. There appears to be a doubt whether the instrument is intra vires in so far as it inserts Form 12B.2 into the Rules of the Court of Session, when the purported effect of that form is to require a prospective lay representative to make a declaration disclosing spent convictions. That provision appears to be of doubtful vires because it purports to disapply the effect of section 4(1) of the Rehabilitation of Offenders Act 1974 in the absence of any identifiable power enabling the Court of Session to make provision to that effect. 61. Furthermore, the Committee draws this matter to the attention of the Justice Committee as lead committee on the instrument. This instrument is not subject to any further parliamentary procedure but purports to make substantive provision which modifies the rights and protections of individuals and disapplies primary legislation. 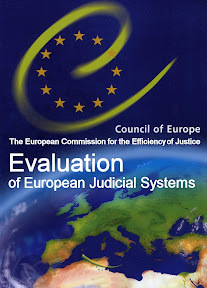 The Committee accordingly considers that this raises an important constitutional point about the respective functions of the Parliament and the rule-making authority, and recommends that the Justice Committee consider the matter further. (a) Is it intended that a person who has become a rehabilitated person (and whose convictions are spent) should be required to disclose those convictions notwithstanding section 4 of the Rehabilitation of Offenders Act 1974? (c) If that is not the case, to explain why it is considered that Form 12B.2 makes it sufficiently clear (in particular having regard to the likelihood that the form will be completed by those who are not legally qualified) that the prospective lay representative need not declare spent convictions. The Lord President’s Private Office responded as follows: (a) Yes. (b) The powers to make the court rules are contained in sections 5 and 5A of the Court of Session Act 1988. In particular, paragraphs (a), (b) and (ef) of section 5 are relevant for these purposes. 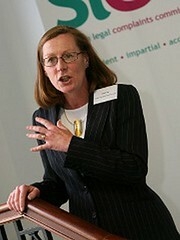 The Lord President’s Private Office takes the view that the court’s rule-making powers also require to be read against the background of section 7(3) of the Rehabilitation of Offenders Act 1974, which enables the court, at any stage in any proceedings, to require evidence relating to a person’s spent convictions, notwithstanding the terms of section 4(1) of the 1974 Act, where the court is satisfied in the light of any considerations which appear to it to be relevant that justice cannot be done except by admitting or requiring the evidence relating to those spent convictions. Other exclusions of section 4(1) of the 1974 Act (including exclusions relating to certain types of proceedings in the Court of Session) are set out in the Rehabilitation of Offenders Act 1974 (Exclusions and Exceptions) (Scotland) Order 2003. (c) In light of the answer to question (a), question (c) does not require to be answered. 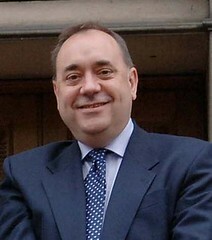 ‘Radical’ land reform announced by the man with 225 lawyers, First Minister Alex Salmond. LAND REFORM for Scotland is again on the cards, according to a ‘radical’ review announced by Scotland’s First Minister, Alex Salmond who claims the newly announced review will deliver a more successful Scotland with stronger communities and economic growth. Whether Mr Salmond’s land reform review is any more than a typical politicians Public Relations stunt and whether it will actually deliver a coherent reform tackling, as land expert Andy Wightman writes “real issues concern inflated land values, affordability of housing, succession law, tax avoidance, secrecy, absentee landlordism, theft of common land, land registration laws, common good etc” is yet to be seen. In fact, rather than read the Scottish Government’s Press release, reprinted below, readers should first visit Andy Wightman’s website Land Matters, to read the facts behind who owns Scotland’s land and why Mr Salmond’s review will count for little unless the real issues are discussed & tackled. A radical review of land reform will deliver a more successful Scotland with stronger communities and economic growth, First Minister Alex Salmond said today. Speaking in Skye where a summer cabinet meeting was convened, Mr Salmond revealed details of a new Land Reform Review Group that will oversee a wide ranging review of land reform in Scotland. Dr Alison Elliot, who has extensive experience working in the community and voluntary sector, will chair the group. She will be joined by Professor James Hunter and Dr Sarah Skerratt as vice chairpeople, who have experience of the Highlands and Islands and rural development. A further 10 advisers – with expertise in areas such as property and land issues, economics, legal issues, community-led organisations, landownership, forestry and access – will also be appointed to the group shortly. It is anticipated that the Land Reform Review Group will report in a series of stages to Scottish Ministers, providing consideration of what the outcomes of land reform should be and what reforms are required. By the end of 2013 the Scottish Government would expect a report on any legislative changes that are required to allow this to be taken forward. Mr Salmond continued : "I want this review to deliver radical change for both rural and urban areas, developing new ideas which will improve current legislation as well as generating even more innovative proposals. The expertise and experience of those on the group will be key to its success and that’s why I’m delighted Alison, James and Sarah have agreed to take forward this important project." Dr Elliot said: "I am delighted to take this opportunity to review land reform in Scotland. I want to take a look at all the opportunities that exist to promote more communities taking control of their future by taking control of their land. I expect it will be an interesting, and challenging job and I look forward to getting up and down the country promoting debate." 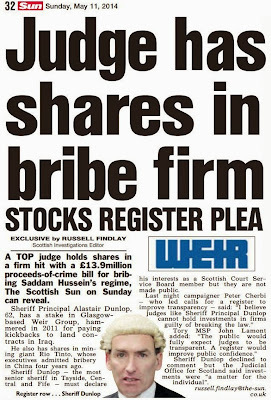 Fine words, however, given the Scottish Government's record of backtracking on reforms of the legal system, from attempts to mothballing Lord Gill’s CIVIL COURTS REVIEW, to tinkering with Scots criminal law in the hopes of giving the Crown Office more [dubious] conviction statistics to brag about, just don't expect too much transparency or land reform from Mr Salmond when lobbying from vested interests, big business & political donors raise their tentacles. 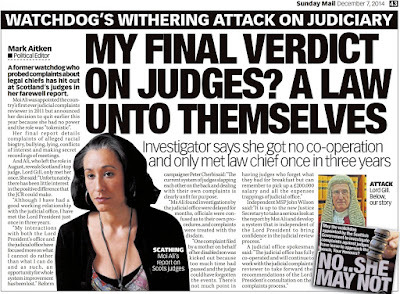 Jane Irvine, SLCC Chair : £300 a day for some, benefits seized to pay lawyers for others as regulator accused of failure to clip disputed fees. 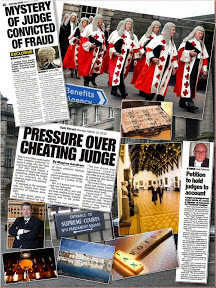 PERSISTENT FAILURES at the Scottish Legal Complaints Commission (SLCC) including A RELUCTANCE to use key powers which enable the ‘independent’ regulator of Scottish lawyers to reduce or even nullify fees of solicitors who ruin their clients legal interests are being blamed for the predicament of a Mr William Gordon of Perth, who has now been made bankrupt by Perth based law firm Kippen Campbell, over demands he must pay fees for a case which collapsed because his lawyers withdrew from acting for him. 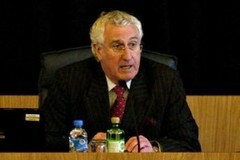 Mr Gordon’s plight comes as a result of a series of bitter, ‘one sided’ court actions held in Perth Sheriff Court, where agents acting for Kippen Campbell demanded Mr Gordon be sequestrated to pay fees they claimed were due to them for legal services provided for a medical damages claim being heard in the Court of Session. 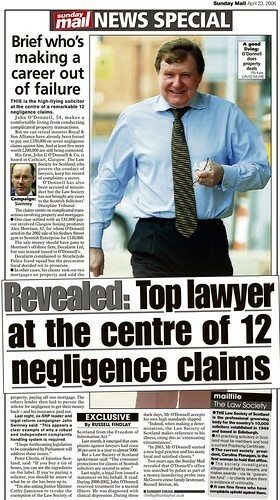 However, documents obtained by Diary of Injustice in connection with complaints made to regulators show the Perth law firm walked away from Mr Gordon’s case after he made complaints about their service & conduct to the Scottish Legal Complaints Commission, who typically, backed the law firm despite considerable allegations of service failures provided by Mr Gordon to the SLCC. 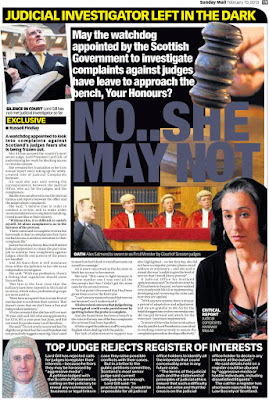 Earlier this week, it was reported by the media that Glasgow based accountants Wylie & Bisset, who are now pursuing Mr Gordon, attempted to seize his home (even though he does not own it) and the home of another family to pay back the Perth law firm for debts the law firm claims were incurred on Mr Gordon’s damages claim in the Court of Session, now ruined because he is unable to obtain any further legal representation. 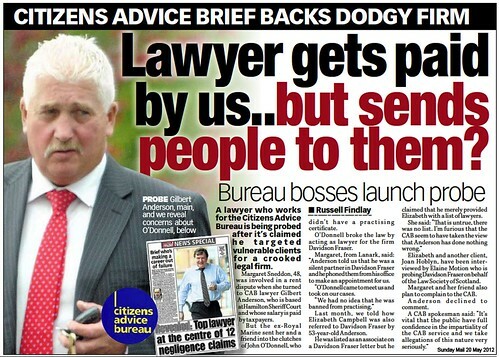 Scottish Law Reporter quoted an article from the Herald newspaper, and further reported HERE : Glasgow based accountants Wylie & Bisset who are acting on behalf of the Accountant in Bankruptcy, sent demands to Kippen Campbell’s former client Mr Gordon who lives in Perth, threatening seizure & sale of his property, which he does not own, and the seizure & sale of another property owned by an unconnected family who live in Rattray, Blairgowrie, whose surname is also Gordon. Threatening letters – Pay up for lawyers fees or we make you homeless say AIB’s agents. 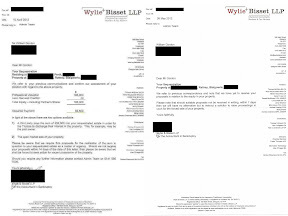 In letters sent to Mr Gordon, Wylie & Bisset demand a “required payment” of NINETY TWO THOUSAND & FIVE HUNDRED POUNDS, and goes on to threaten “We require firm proposals for the realisation of the sum in question to your sequestrated estate as a matter of urgency. Should we not receive your proposals within 14 days of the date of this letter, then please be aware that we shall be forced to seek action for vacant possession of the property.”. 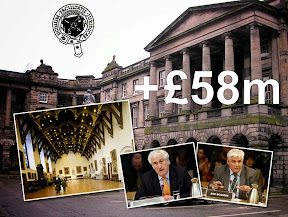 Accountant in Bankruptcy, Scotland’s insolvency service with added errors. The Accountant in Bankruptcy was asked by Diary of Injustice to explain why their agents, Wylie & Bisset attempted to seize Mr Gordon’s rented property and that of another family. However, a spokesperson for the AIB explained away the attempted property grab as “errors”, telling Diary of Injustice yesterday : “As previously advised, Wylie & Bisset are one of AiB’s Insolvency Service providers and are required to administer cases in accordance with our processes. The administration of sequestrations is a complex task where a range of information is obtained from various sources. During this process, it is possible for errors to occur, though the Accountant in Bankruptcy is satisfied that our providers give a consistently high standard of service when acting on our behalf. Where errors are discovered, our providers are required to review their processes and make necessary changes to ensure that similar errors are not repeated. 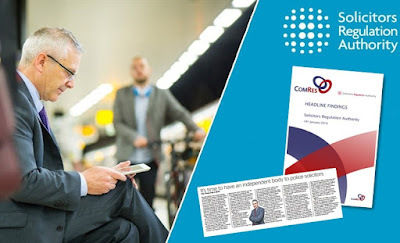 In cases where individuals have been negatively affected by an administrative error, our providers will attempt to rectify the issue as soon as possible and where appropriate, will write to apologise for any inconvenience caused." 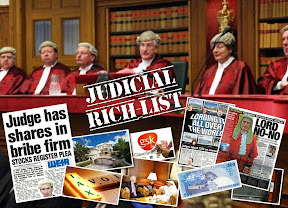 Further enquiries by Diary of Injustice have now established Wylie & Bisset, acting on behalf of the AIB have also frozen Mr Gordon’s Lloyds TSB bank account and seized his disability benefits payments, leaving him without any cash to live on whatsoever. Documents & copies of communications between the bank & Mr Gordon appear to show the bank simply froze Mr Gordon’s account on a telephone call ‘say so’ from Wylie & Bisset. This information was put to the Accountant in Bankruptcy, who attempted to explain away the seizure of Mr Gordon’s benefits by claiming they had no idea what the source of payments into bank accounts were. A spokesperson for the AIB claimed : “Where a trustee discovers that the debtor has a bank account, they may contact the bank to have the account frozen. This action may be appropriate to prevent the debtor from inappropriately withdrawing funds after the award of sequestration. Where an account has been frozen, it is the responsibility of the debtor to contact the trustee to make representations around the money held in the account. This is particularly important where the debtor is reliant on state benefits that are paid directly into a bank account, as the trustee is unlikely to be aware of the origin of the money held in the account. This scenario can be avoided if the debtor co-operates fully with the trustee and provides information on their income and savings." The official went onto inform Diary of Injustice that her organisation has received numerous reports of law firms threatening clients with bankruptcy if they did not pay what appear to be dubious demands for fees. In other cases, law firms have simply gone ahead and made their clients bankrupt without even giving them a chance to question the legitimacy of the fees claimed to be owed. 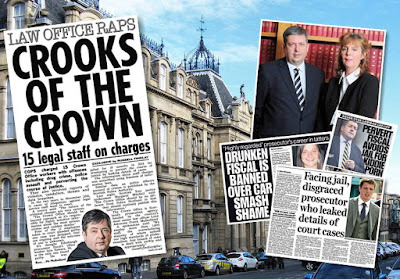 Speaking to Diary of Injustice late last night, a senior source in the Scottish Government acknowledged there is a growing problem with law firms threatening clients over legal fees, an issue which has also been brought to the attention of some msps. He went on to say he believed law firms were using their influence in local courts to easily obtain bankruptcy orders against clients who have little or no chance of obtaining legal representation to challenge the law firms demands. 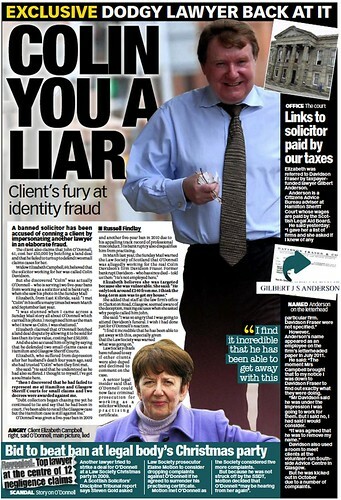 Meanwhile Mr Gordon is running short of cash while the Accountant in Bankruptcy and their agents run up large charges to the taxpayer in the course of pursuing a client who has no access to justice to challenge what has been done to him, in the name of paying a firm of lawyers based in Perth. 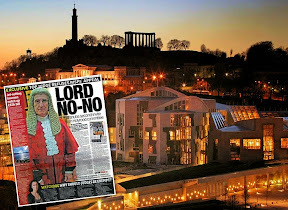 Mr Gordon is without legal representation and his doctor has told Perth Sheriff Court on numerous occasions his patient is too unwell to attend court hearings. 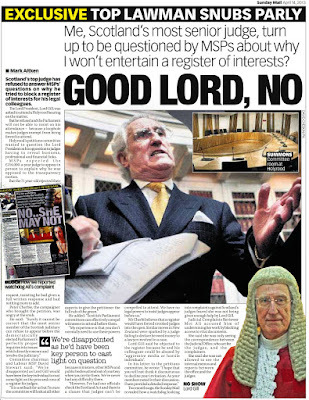 The unavoidable conclusion is Mr Gordon’s predicament could easily have been avoided if the Scottish Legal Complaints Commission had listened to him during the course of his complaint, and at the very least, reduced or nullified the fees of a law firm who walked away from their client when he discovered his case was not being pursued as he had instructed. 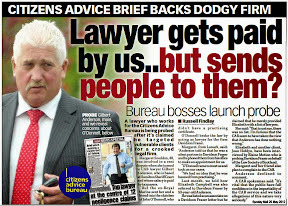 Citizens Advice Bureau in Hamilton investigated allegations over their in-court adviser Gilbert Anderson. 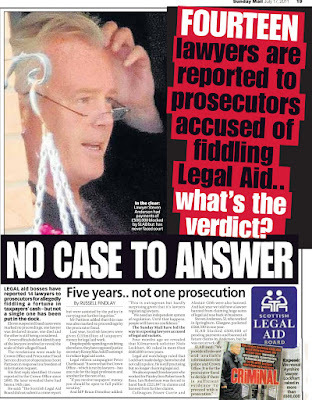 AN INVESTIGATION into Gilbert Anderson (53), a publicly funded ‘in-court’ adviser based at Hamilton Citizens Advice Bureau who’s salary is paid for by the Scottish Legal Aid Board (SLAB) is due to be completed today, Friday 13 July, several weeks on after allegations were made he had referred clients with legal difficulties to a solicitor who was already struck off and was using the identities of colleagues in the legal profession to fool his victims. 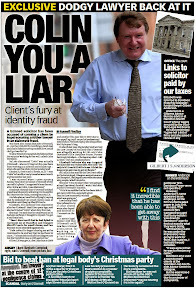 Diary of Injustice reported on the allegations in an earlier article made against Gilbert Anderson (53), here : Crooked lawyer impersonates DEAD COLLEAGUE to lure clients in fraud scam as Law Society of Scotland’s self regulation of solicitors fails yet again detailing a letter of complaint submitted to Hamilton Citizens Advice by client Elizabeth Campbell, who challenged discrepancies in claims from Citizens Advice and the Scottish Legal Aid Board that there was no case to answer regarding Anderson’s actions. The letter went on to inform Hamilton CAB that Mrs Campbell “could not have have got Davidson Fraser’s name from a list of Legal Aid Solicitors as they didn’t do Legal Aid. Mrs Campbell goes on to detail a number of points regarding Mr Anderson’s referrals to the already struck off O’Donnell, who was posing as Colin Davidson, who has since died. 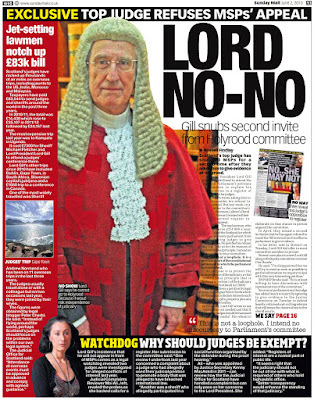 Scottish Legal Aid Board ‘continue to monitor the situation’ on Gilbert Anderson. 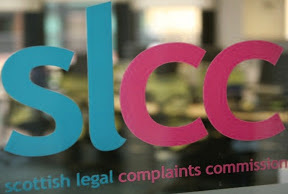 A spokesperson for the Scottish Legal Aid Board said in response to enquiries : “We cannot comment on a specific complaint which is the subject of an investigation by an external organisation. 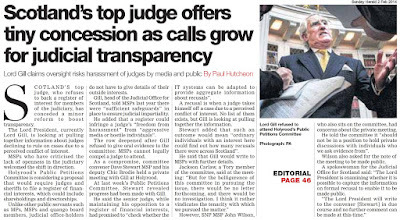 However, we have been informed by Hamilton Citizens’ Advice Bureau that a complaint has been received in relation to the Hamilton In-Court Advice Project based at Hamilton Sheriff Court. 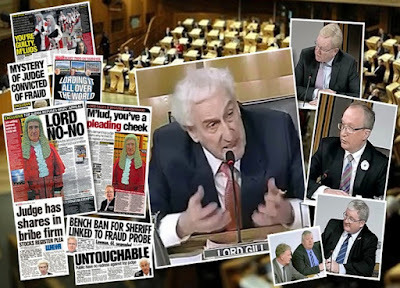 Lord President Lord Gill’s installation & speech: Will Scots “Victorian” justice system reform or remain a self serving fiefdom of vested interests? 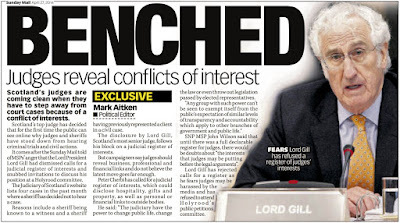 Lord Brian Gill Scotland’s new Lord President .. Is the reforming force with him or are we in for more of the same. 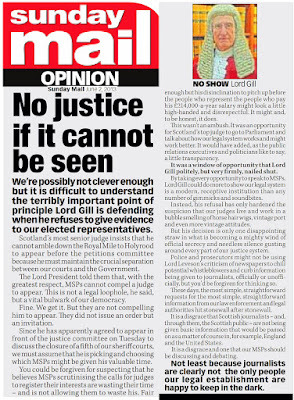 SCOTLAND has a new Lord President, Lord Brian Gill, formerly the Lord Justice Clerk under the previous Lord President, Lord Hamilton. 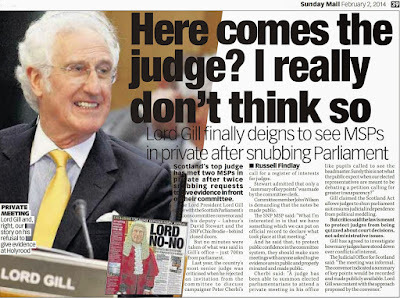 Lord Gill, as we are all very well aware, is generally seen as a more ‘reformist’ judge than his predecessor, not least because of the many harsh criticisms contained in the CIVIL COURTS REVIEW, a two year savage critique of Scotland’s antiquated Civil justice system which Lord Gill himself described as “Victorian model that had survived by means of periodic piecemeal reforms”. 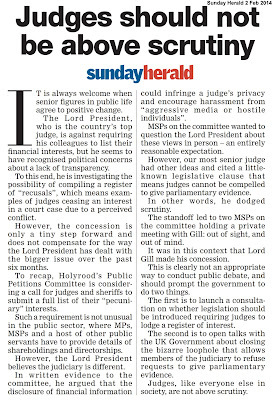 Lord Gill’s speech at his installation as Lord President has been published by the Judiciary of Scotland website, and is reproduced here for those who are following the debate on reforming Scotland’s Civil justice system with a view to giving consumers a higher priority and wider access to justice, instead of what some in the legal profession have in mind, which seems to be more along the lines of fattening the profits of ailing law firms and restricting who can do what in our own courts, paid for at the end of the day, by taxpayers. "The solemnity of this ceremony and the oaths that I have taken are a reminder to all of us of the honour and the responsibility that go with the historic offices of Lord President and Lord Justice General. I am conscious of the example of those distinguished predecessors in this office whose judgments have illuminated and developed our law as a living system rooted in principle and adaptive to our ever-changing society. 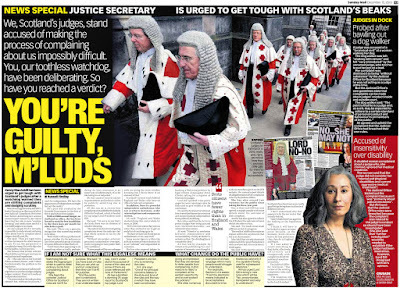 It will be my task to be worthy of their example and to serve Scotland well through the work of these courts. 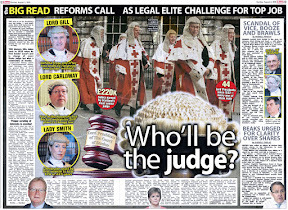 The Scottish legal system is about to embark on the most significant changes that have taken place in over a century. 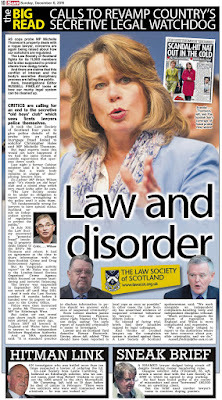 The Parliament will now consider legislation for the creation of a Scottish Civil Justice Council. 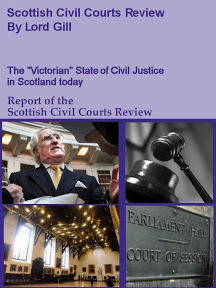 In due course legislation will be brought forward to implement the main proposals of the Scottish Civil Courts Review. There will also be major changes in our criminal procedure reflecting some of the recommendations of Lord Carloway and Sheriff Bowen. The next few years will be a period of transition. I am confident that the profession will adapt flexibly to whatever changes emerge. I am convinced that these changes will be most effective and beneficial if all of us, for our respective parts, approach them with an open mind and in a positive spirit. 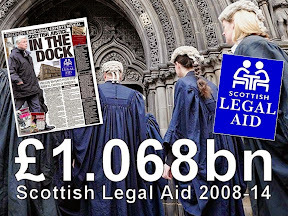 I hope that in this way Scotland’s legal framework will best serve our society’s needs. This building has been my workplace for most of my life. I would like therefore to conclude these brief remarks with a few words to those who work here. First, a word to the administrative and support staff of the courts. The complex process by which justice is brought to the citizen depends crucially on your efforts, which are too seldom publicly acknowledged. I assure you that your work is valued and appreciated. Recently you have maintained the highest standards of service despite the upheaval of the building works all around you and despite the volume of work that has been imposed on you. I am glad that I am a personal friend of so many of you. I assure you of my support in all that you do. 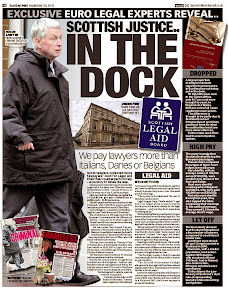 Next, a word to the members of the Bar and the solicitor advocates who practise in these courts. Having been a practitioner myself, I know the stresses that you experience in your professional lives – preparing cases at short notice, meeting deadlines, arguing difficult points, and so on. I know the burdens that you bear; and I shall try not to add to them. I enter upon the office of Lord President encouraged by the indescribable bond of mutual confidence that exists between the Bench and those who appear before it. It is a bond that I shall respect and foster. Lastly, I address my esteemed friends and colleagues on the Bench. I am grateful to you for the supportive words that you have expressed to me on my appointment. It is a privilege to preside over a court of such wisdom and learning. 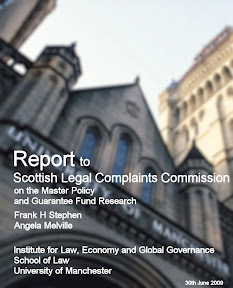 This jurisdiction, through its judgments and through the work of the Scottish Law Commission, has had a powerful influence on legal development in the English-speaking jurisdictions and beyond. 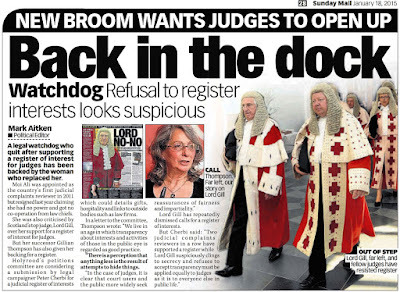 With the help and support of you, my trusted colleagues, I hope to maintain Scotland’s reputation throughout the legal world. It will be a privilege to be your President and your defender".